Capping off this week is a new review for a game that released late last month, Wii Sports Club. It's five sports in one, don't you know! Here's our review. Can't get enough Wii Sports? Then join the club! When the Wii originally launched in 2005, many Nintendo fans latched onto the system for the promise of playing The Legend of Zelda: Twilight Princess. However, it would actually be Wii Sports that would become a killer app for the mainstream, as well as for folks who had never picked up a gaming controller in their lives. Since the Wii bubble has burst, Nintendo has tried (and unsuccessfully so) to regain the magic and enthusiasm of the world with the Wii U through release sequels to various Wii series games on the system. 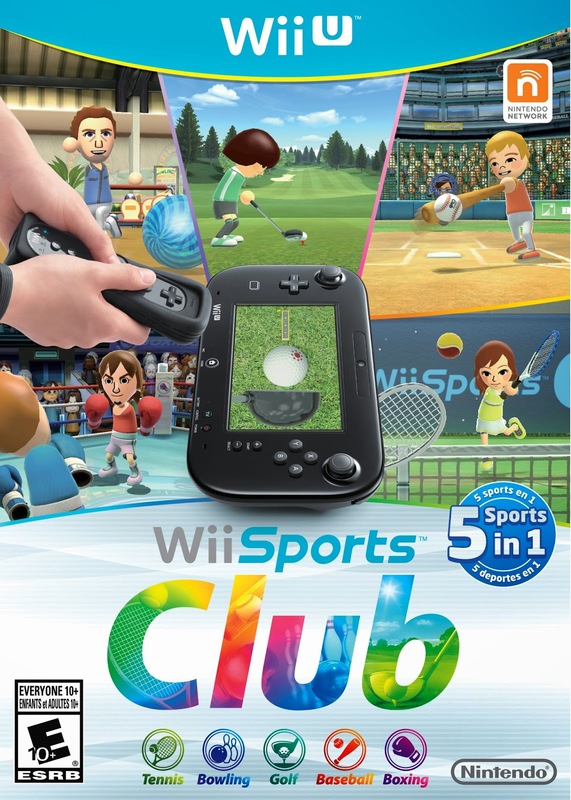 Previously released digitally on a per-sport basis, Wii Sports Club finally has been given a retail release with all five of the original Wii Sports in one physical package. Should you join the club? 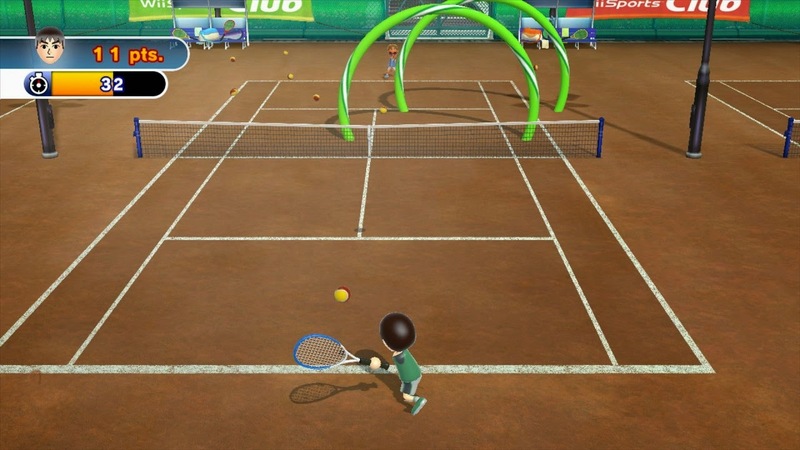 Wii Sports Club features the same five sports featured in the original Wii Sports, only this time they've been given added options and features. 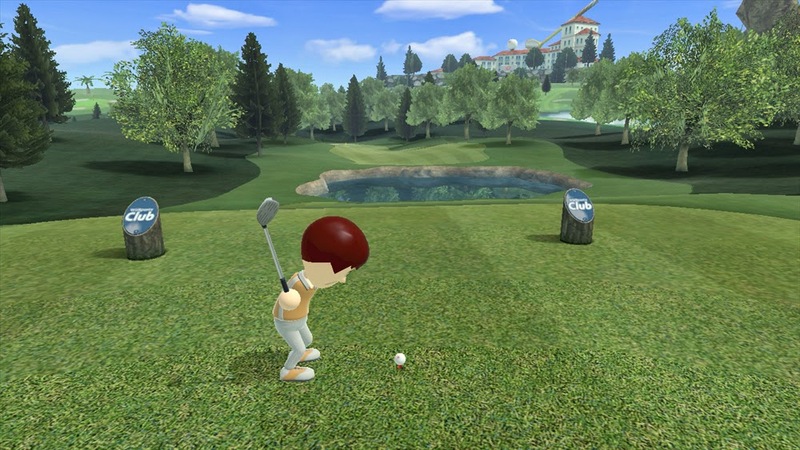 The most notable two of which are full Wii MotionPlus support and online play for each sport. The visuals have been drizzled with a high-definition coating, but try as Nintendo might, no one is really going to believe for a second Wii Sports Club is wonderful or impressive to look at. In fact, they might just believe the opposite. 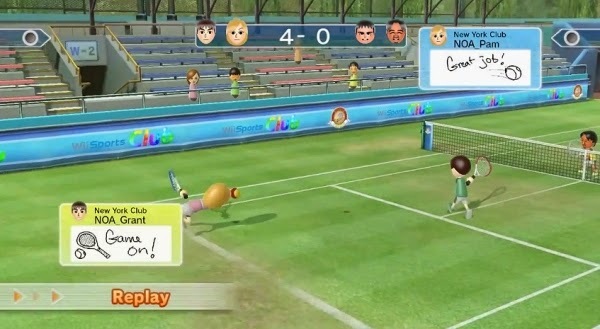 Upon the get-go of starting up Wii Sports Club, you're able to join a regional club for your territory, state, area of the world, etc., where you earn points for each win you record, as well as have the ability to post Miiverse words of encouragement that show up within crucial moments of the various sports (e.g. when you achieve a home run in baseball or reach match point in tennis). You are not stuck with the initial club of your choosing. You can switch clubs as you wish, but there is a 24 hour waiting period you must sit through if you wish to change again. A lesson in not being wishy-washy perhaps. As for the actual sports, tennis has you playing doubles either with an AI or human partner or with you controlling both partners at once. Player movement is done automatically, so what you're required to do is swing at the ball with a forehand or backhand swing in order to make sure the ball stays within bounds and that your opponents can't hit it back to you. Not only is the type of swing important, but so is the timing of your swing. It can become frustrating when you constantly and confusingly hit the ball out of bounds, and yes, that WILL happen a lot at first. However, like most of the sports in this Wii U compilation, practice makes perfect. Well, not perfect, but it will make you better! Bowling allows you to choose between doing ten frames of traditional 10-pin bowling or the popular version around the SuperPhillip house, ten frames of the 100-pin bowling. It's pretty much all in the wrist with bowling. Curving your throws to get the perfect trajectory to make consistent strikes and spares is what it's all about. Of course when you have one pin standing up, throwing it straight also is of the utmost importance. 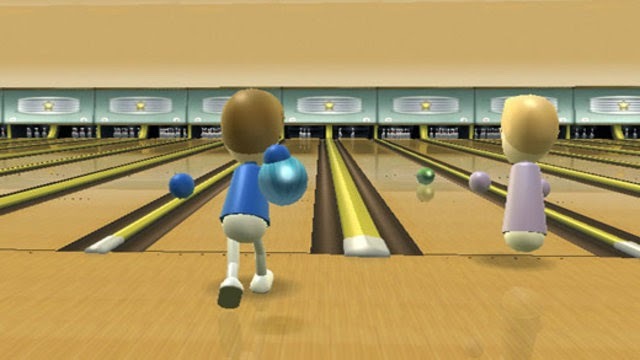 You can move along the starting line with the d-pad of the Wii Remote, hold a button down, wind back and then toss the bowling ball down the lane, hoping for the best. What I consider the most difficult of the sports to learn and ordinarily do well in is golf, which offers three unique courses to play through. This is one of the two sports in Wii Sports Club that utilizes the GamePad in some way, but here it's pretty gimmicky. The GamePad is to be set under the Wii Remote and serves as your power gauge and tee. For me, this was a literal pain in the neck (and back). Those who love to just grip it and rip it need not apply. 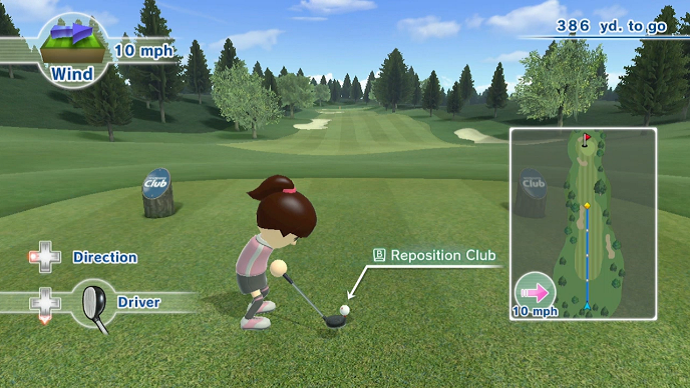 Wii Sports Club golf requires multiple practice swings to get a "swing" of things, and even then you can still mess up your swing rather easily, totally ruining your chance for even par. Perhaps my favorite of the sports in this collection is baseball. Not only does it play well with the Wii Remote, the Wii U GamePad use is rather novel, all things considering. Baseball consists of a three inning game where teams take turns pitching and batting. 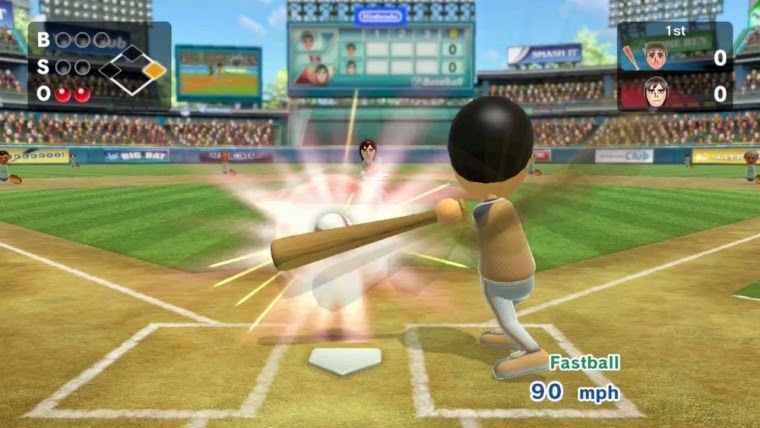 The pitching team uses the GamePad's built-in gyroscope to aim at the plate somewhere, while one of four face buttons determines the type of pitch and speed. 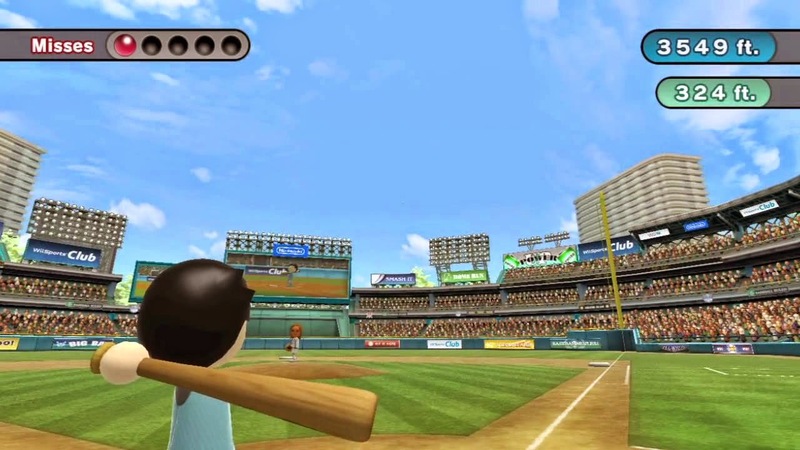 When a ball is hit towards an infielder or outfielder (both automatically move towards the ball), a red circle appears on the GamePad screen, indicating where the ball is. If the GamePad player lines up the circle of the player with the circle of the ball for a long enough duration, then they'll successfully catch it. 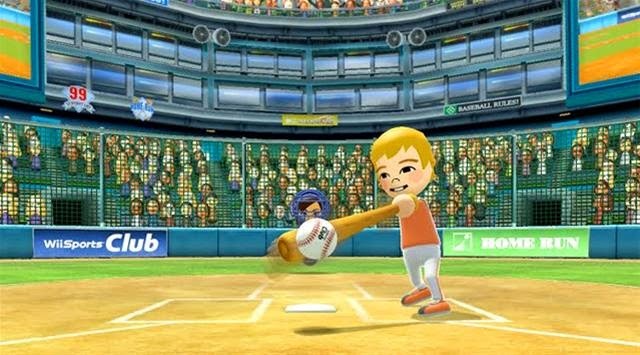 Meanwhile, the batter doesn't have to worry so much about strength in their swings with the Wii Remote, but instead they need to focus on their timing. Hit too soon, the ball will be hit right, while hitting too late will make the ball fly to the left. Maybe I got that backwards, but you get the point hopefully. There's no sudden death or extra innings to speak of. All there is is a five run mercy rule for those teams who just can't catch a break from the baseball gods. 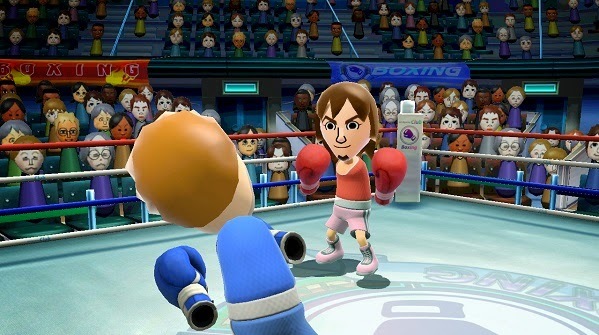 Lastly, boxing is the final sport in Wii Sports Club. This can be played either with one or two Wii Remotes at the same time. The Wii Remotes are used to lean left and right to dodge and to get openings, as well as to make offensive assaults onto opponents. It's not just about wailing on your opposition, however. You need to also be holding your gloves (the Wii Remotes) to block punches by your opponent, too! While many matches can devolve into tiring waggle fests, I actually found myself enjoying what boxing had to offer. Each of the five sports come with various practice mini-games to focus on particular aspect about the sport. For instance, your baseball bat timing is tested by how well you can aim for colored panels of varying points. Time your swings right to earn the most points. Then there's a bowling mini-game that gives you three tries apiece to knock down all of the pins that form a particular shape. The mini-games allow you to get a groove going before you try to tackle opponents both in AI and human form. The latter is easily available no matter if you have friends and family near home or not. That's because Wii Sports Club offers online play. 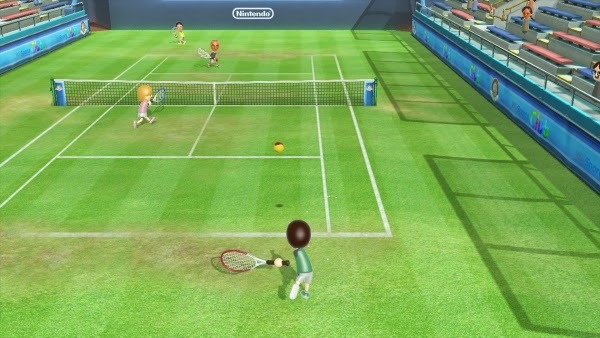 Each of the five sports can be played online either with a fellow Wii U buddy on your friends list or a total stranger. Wins and losses are recorded, and you earn points for being victorious. Depending on you and your opponent's connection, lag can either be small or very noticeable. It's usually the former, but when it does get bothersome, it can be especially aggravating. Another knock on the online play is that voice chat is totally unavailable. In its stead, you can map three custom phrases to the up, left, and right directions on the d-pad. Of course, these must be given the okay by Miiverse mods before you can use them. Overall, Wii Sports Club is a recommended purchase for those who have the time to learn each sports' eccentricities and controls. If you're looking to waggle like in Wii Sports, you're not going to have much fun, unless losing all the time is something that excites you. Wii Sports Club has a lot of idiosyncrasies to its controls, and if you have the patience to practice and learn them, you'll find yourself having a better time than someone who does not. Online play may not be perfect, but it is serviceable, and the extra modes and achievement-like stamps gives you something to shoot for when you're not owning others or getting owned yourself online. There's plenty of worse clubs out there to join, so you should at least give Wii Sports Club an honest try.